It’s pretty much impossible to review The Godfather Part II out of context from The Godfather because the stories are so intertwined it’s truly one long film. In fact, as most fans know the films were in fact combined in a later release that told the story chronologically, and some believe this is in fact the best way to view The Godfather story. I won’t go that far, but again I think the stories are so connected it’s not fair to review one without discussing the other. That being said, I’ll try. I will reserve final judgment about which film I think is better for after I view The Godfather again as part of this quest, but it should be noted that part two comes in at #32 on this list and the original is #2. Having seen both several times I find it hard to disagree, and in fact watching The Godfather Part II again yesterday for this review I was struck by how weird it feels as a standalone film. Part two serves two purposes really — one is to introduce how Vito Corleone got his start in the family business and the other is to witness how Michael Corleone completes his father’s work and ends up bringing the family to the point of both ultimate power and internal demise at once. Michael foreshadows this midway through the film when he asks his mother if it’s possible to help the family while at the same time losing it. Clearly it is. For me the parts of the film about Michael show how power creates paranoia. Michael becomes so obsessed with trying to figure out who tried to kill him that he eventually blames all of his so-called enemies and brings them all down. At the same time, he brings down his family and at the end he’s left with ultimate power but he’s all alone. This is in contrast to Vito’s quest for power, which we learn from the film comes as a result of circumstances. Vito is witness to the murder of his father, his brother and his mother. By heading off to America he rescues himself from the same fate, but ultimately his circumstances in New York also lead him to crime. I think it’s clear Vito had an innate ability within him to be a criminal, but it isn’t until he loses his job and becomes desperate to provide for his family does he let the criminal out. And we know from part one of the film that Vito is a brutal criminal, but his motivation is always the betterment of the family. Michael did not learn this lesson from his father. Is The Godfather Part II a great film? I’m not so sure. It’s disjointed and the past vs present elements get confusing. Also, not a whole lot really happens in part two other than Michael wiping out the last of his enemies. The great lines that so many of us men quote are mostly from part one, though there are a few gems in part two (I know it was you, Fredo. You broke my heart. You broke my heart!). But for me the film is much ado about nothing. Again, it’s all part of a great story, but on its own part two doesn’t have as much to offer as part one. Of course, the Academy didn’t see it that way. It doled out six Oscars including Best Picture (it beat Chinatown, which I think is a better film and if AFI counts for anything it does as well). Robert DeNiro won for Best Actor and Al Pacino, Talia Shire, Lee Strasberg and Michael Gazzo were nominated for acting. Frances Ford Coppola won best director and the film also won Oscars for art direction, music and writing. 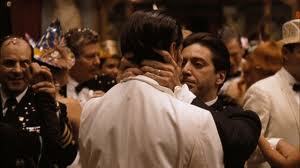 The Godfather Part II is a great film, no doubt. But really it’s only great when considered in context of the Godfather saga.